Where in the World is Brandon O'Brien? When I got into town yesterday and saw how amazing the scenery was, I knew I had to spend today covering as much of it on foot as possible. When I was checking it last night, the weather was looking pretty sketchy for today (70% chance of rain and thunderstorms) so I decided I'd get an early start and try to cover as much ground as possible before any rain hit. I made a quick stop by Sainsbury's to pick up some bread and ham for lunch and then set out for the Great Orme mountain to the west side of Llandudno. There was a little confusion about where the trail actually started but eventually I figured it out. I worked my way up past a ski area (yes, they actually have a ski area here!) and up to some amazing views. 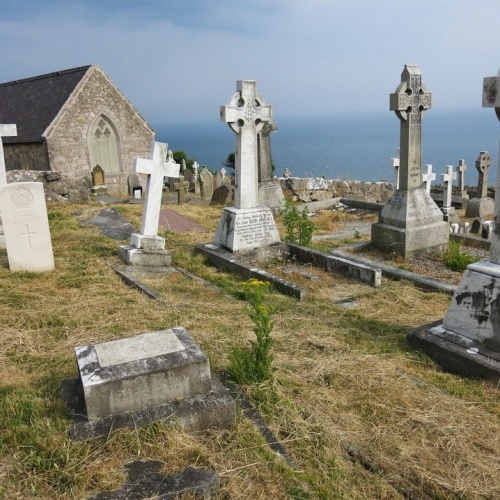 Along the way I passed by St. Tudno's Church that has a huge cemetery overlooking the ocean. 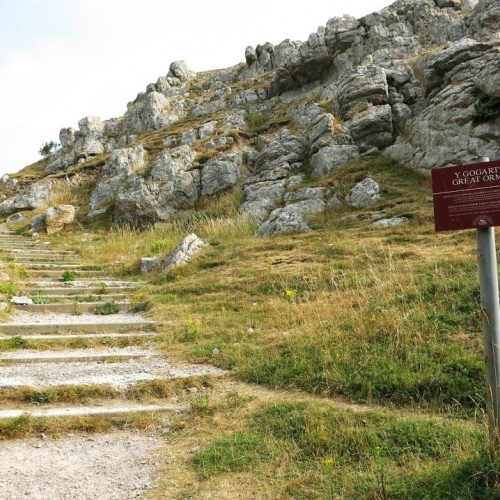 From there, the summit of Great Orme was visible and a pretty dauntingly steep climb, but I powered through and went straight up the grassy side without relying on any switchbacks. The views from the top were great. Unfortunately it was rather hazy so I couldn't see too far, but on clear days you can see the Isle of Man 57 miles off the coast. I'd take haze over rain though. It was about 9:45 now and the skies still looked pretty good. The storms they were calling for weren't making themselves apparent yet. Seeing Conwy in the distance got me thinking... It's only 4 miles (as the crow flies) to Conwy and the castle/city walls. Should I go for it? Yes, the answer was yes. I could see a hike along the beach that would take me all the way to Conwy. That was reassuring since walking along the roads here seems like a death trap. There's no shoulder at all and what they have as a two lane road should really be a one-way. I'm still amazed at how there aren't more accidents. 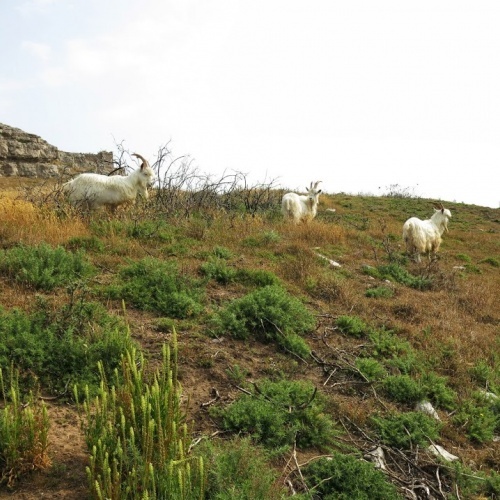 While I was descending the mountain to the beach I passed a group of goats grazing along the cliff faces. I snapped some photos and carried on. When I made it to the beach I found some shaded benches and sat there for a bit to eat lunch and enjoy some views of the Wales coastline. The walk from Llandudno to Conwy was nice. There was a nice path that switched between sand, pavement and gravel. It was about 5 miles along this path to Conwy. After rounding a bend along the path I could see Conwy across the harbor. The castle was on the left and the old town on the right. 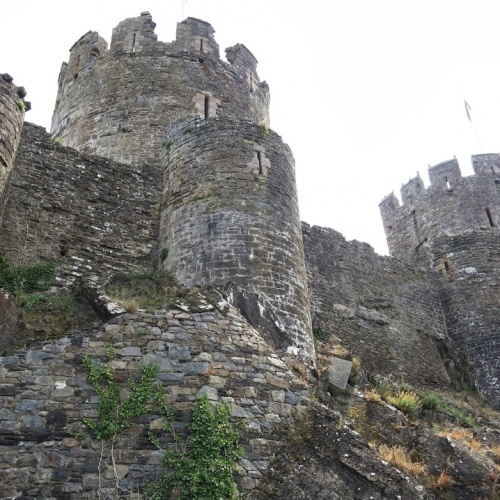 Surrounding Conwy are the old town walls that you can hike along. There were some really great viewpoints of the castle from the path and road so I had fun taking some photos. I went up to see how much admission was and it was 5.60 pounds... a little more than I wanted to pay. Instead I found the city wall and hiked around that. I think the city wall offered better views than the crowded castle would have anyway. By now I was probably about 8 or 9 miles into the hike and was feeling the heat and humidity from the day. 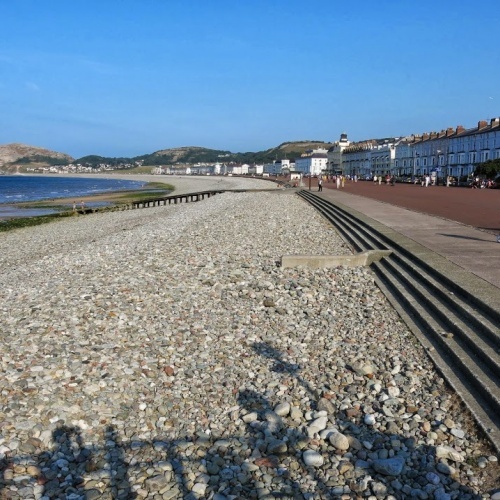 I figured it was probably time to head back to Llandudno so I made my way along the beachfront path back to town. When I got back to town I bought some fresh fruit and enjoyed it by the beach. It was about 2:30 by now so I came back to the hostel to shower. Along the way I passed by a book shop offering some cheap books so I picked up a new book for 2 pounds. I figure that will give me something to do tomorrow when I'm bumming it around the beach. The shower felt fantastic, especially since I had my hiking pants on since I thought it was supposed to be colder and rainy. Turns out the rain never came so I headed down to the beach to read and relax for a few hours until I was ready for dinner. For dinner I picked up some chow mein noodles from the grocery and came back to the hostel to heat it up. I enjoyed it with a cider and some bread before sitting down to answer emails and work on this blog post. If tomorrow is another day like today, I think I'm going to head down to the beach and relax there. My legs got a pretty good workout today so a relaxing day wouldn't be too bad. I've been constantly amazed by Llandudno and how chill of a city it is. If the weather was consistently good like it has been lately, it would definitely be on the top of my places to recommend people visit on vacation. Today was another long travel day. Eric had to be on his train to London by 8:30am and my bus departed York at 10:30am. I had an exciting day of 7 hours on buses and two bus changes ahead of me. My first destination was Leeds where I changed buses to head to Manchester. Once in Manchester I jumped on the Bangor, Wales bus that ran by my destination of Llandudno. 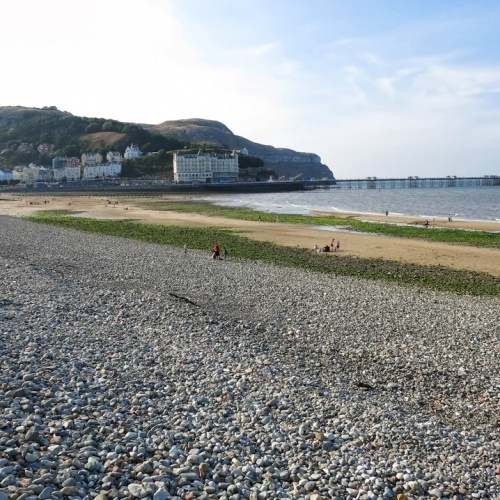 I didn't really know too much about Llandudno before booking my hostel and bus tickets other than the fact that it was on the water, had some really good hiking areas and there was an old castle all within a few miles of town. When the bus rolled into town I was amazed. This seems like the place that all seaside resorts in the States were modeled after. You've got the huge promenade where people are strolling or sitting and eating ice cream, then you have the seaside resorts, B&B's and restaurants on the other side of the street. There's also a big hill/mountain/cliff on the west end of town that has hotels and buildings climbing its face. This is going to be my destination for tomorrow (assuming the weather holds out. The weather is calling for 70% chance of rain unfortunately). The area is filled with hiking trails but there's also a tram and cable car for those less inclined to hiking. Once I got into town I checked into my hostel (I'm the only one in an 8 person dorm tonight!) then set about finding some dinner and enjoying the awesome weather. I had a really filling meal of mashed potatoes, roast beef, carrots, peas, stuffing, fried potatoes and bread. All of that was only 6.99 which is amazingly cheap for the amount of food (and how good it tasted!). Being sufficiently stuffed I thought it would be a good idea to walk it off. I started off toward the pier and walked to the end of it for some nice photos of the entire town's waterfront (check out some of the panoramas in the photo gallery linked below). I didn't feel like that was enough of a walk so I walked the entire length of the promenade, enjoying the people watching and great weather. At one point the Llandudno band was playing some tunes to a large crowd right on the promenade. It was a really nice sight. Unfortunately most of my day was spent on the buses so I came back to the hostel around 8:45pm to answer some emails and write this blog post. I'm going to try to get an early start tomorrow to beat some of the rain and clouds. We'll see how that goes! The first thing we did today was go to the bus/train station so I could get my bus tickets for tomorrow and Eric could get his train tickets to take him to London tomorrow. After getting our tickets we went over to the National Railway Museum and toured it. The museum is actually really nice. They have a recreation of an old train station with different eras of trains. There's also another huge room filled with trains from all over the world plus the Flying Scotchman (a fast train that took people between London and Edinburgh starting in the 30's). We saw everything the railway museum had to offer so we went and grabbed lunch then went to a pub called The Kings Arms so I could get some fresh Samuel Smiths beer. Samuel Smith is brewed in Tadcaster (not too far from York) and has several pubs throughout England. The pub was absolutely packed but we worked our way in and had a couple pints. I've yet to have a bad beer from this brewery and was not disappointed here either. Since we had seen pretty much everything we wanted to in York, we decided to go see the movie The World's End. It was about 5 highschool friends who get back together later in life to try to complete a "Golden Mile" of drinking with one drink in 12 different pubs. It turns out the town is taken over by robots and a bunch of crazy stuff happens. The movie was pretty funny and it probably helped that we had a few pints before watching it too. When the movie ended we weren't quite sure what to do so we went back to the Kings Arms and had some more beers. 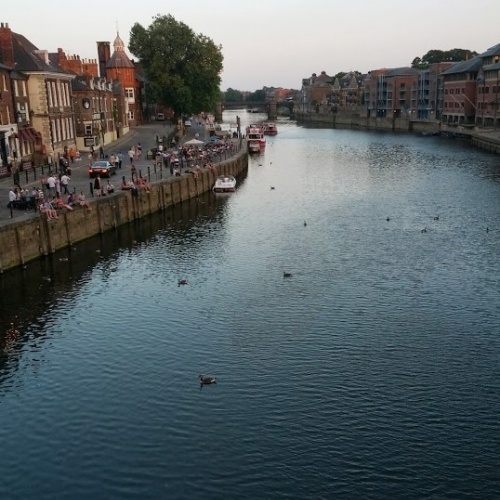 Apparently York is where all the stag, hen and birthday party groups come for a weekend of drinking. They all dress up in ridiculous outfits and pubcrawl their way through town. It was pretty funny watching some of the groups as they made their rounds. We're back at the hotel now relaxing for a bit before heading out for dinner. Eric has to catch his train at 8:30 tomorrow morning and my bus is at 10:30 in the morning. I think we're going to go find some fish n chips since that's what Eric wants for his last meal before he heads home. 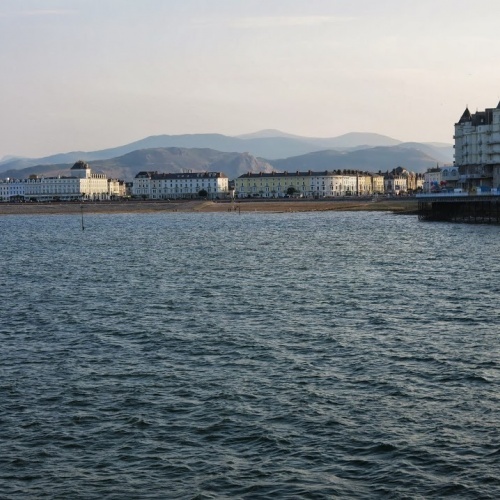 Tomorrow I had to Llandudno, Wales for a few nights. 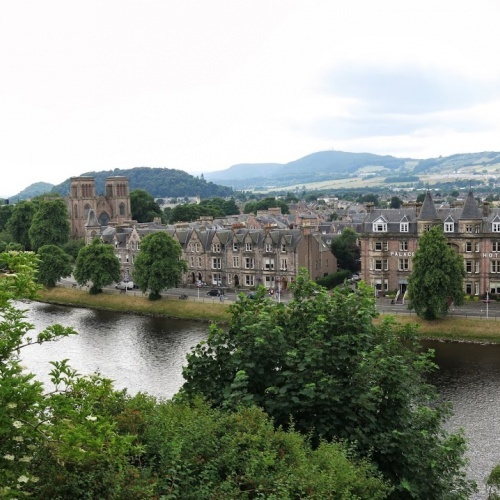 It's a coastal town with some nice hiking areas, beaches as well as some castles and other old buildings. We took our time getting ready this morning since our only plans for the day were to walk around and explore the city of York. The weather is still on the hot side with a high today of 92 degrees. The first place we visited was the York Minster. There has been a church on that site since 627AD and the current structure was started in the 12th century. One of the things I've been struggling with during this trip is trying to decide what to spend money on visiting and what to pass on. Pretty much all of these old churches, museums and castles have admission fees ranging from 5 to 20 dollars. There's no way I can justify paying these fees every time just to take a few photos inside an old building. 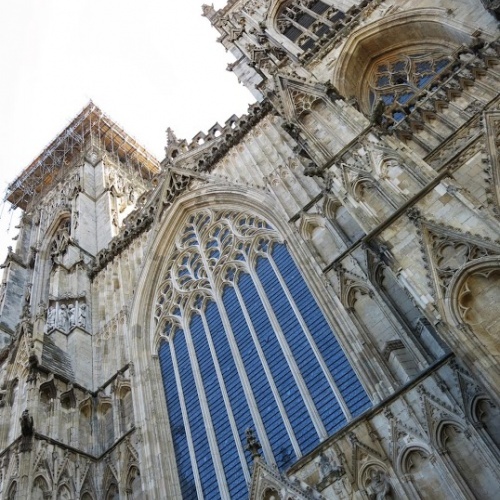 Since I didn't want to pay the 10 pound (15 dollar) fee to enter the York Minster, we just walked around and took some photos outside. 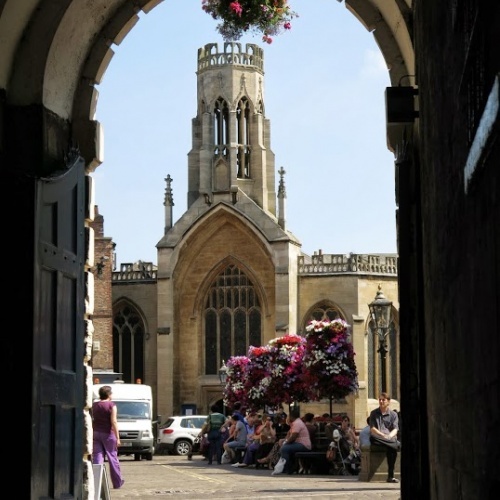 After the York Minster we made our way down to The Shambles. 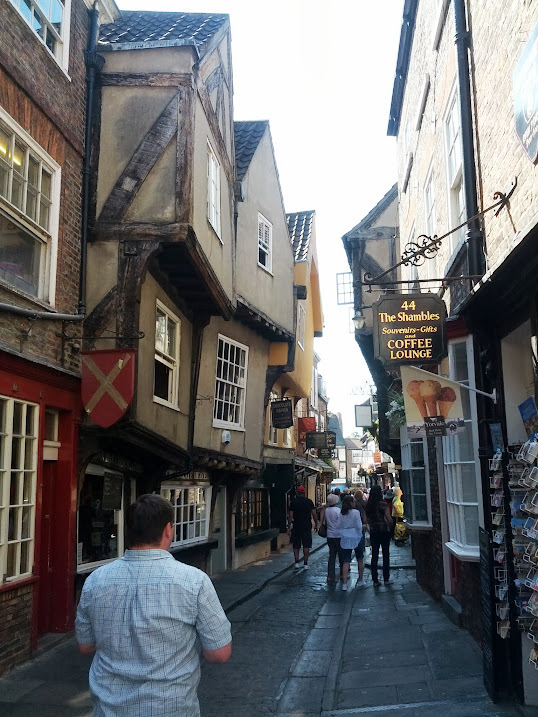 It's a street here in York that has a bunch of really old buildings that are all uneven and leaning into the street. 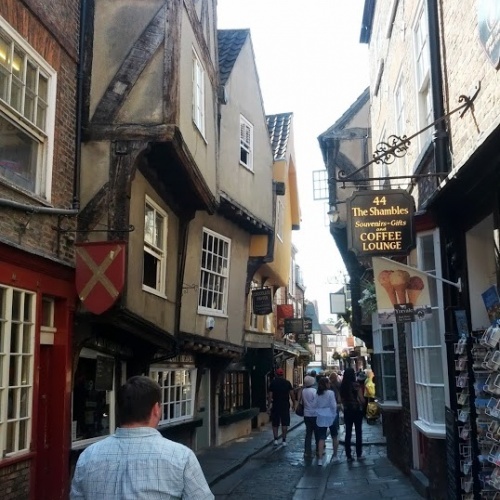 It gives you a bit of a feeling of Diagon Alley from Harry Potter. Next to the Shambles was a big market that had all kinds of stuff ranging from fresh fish to leather goods. If we had a fridge or a kitchen I would have bought some fresh food for the next few days. 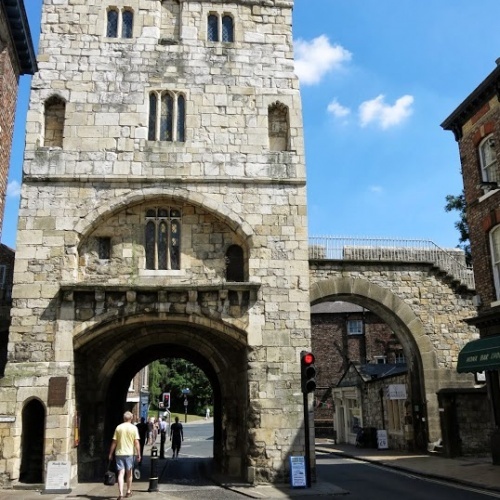 York is a very old city and has a lot of fortifications and towers throughout the old city. One of those is the York Castle (Clifford's Tower). That was next on our list of sights to see so we made our way there. As we were walking there we passed by a pub that was advertising a Festival of Cider with ciders as cheap as 2.09 pounds (about half what other places typically charge). We went in and had a pint before heading to the tower. The problem of paying money to take a few photos struck again when they wanted 6 dollars to get the privilege to climb up the tower. We just took some photos around the outside then walked over to the old city walls that still stands around most of the city. They turned it into a big walking path that's filled with nice views of the city. Fortunately they didn't charge to walk on it so we spend a little time walking around the city. Both of us were getting a little hungry so we stopped into a pub and had some more ciders with lunch. I had a ham and pea soup with a side of fries. The British like their peas which is fine by me! After lunch we walked around the city a little more then ended up finding a Whisky shop. We bought a couple of the tiny bottles and enjoyed them by the River Ouse. We'd been drinking for the majority of the day so we came back to the hotel to relax for a bit. I started researching what my plans would be after leaving York and tried to purchase some bus tickets. For some reason the National Express website kept saying my credit card transaction was declined even though there are pending transactions that appear on my credit card website. I'll have to make sure those don't actually clear or get charged for them. I went down to the bus station to ask about buying a ticket but they had already left for the day. I'll go over there tomorrow to check on it since that'll determine what my plans will be. 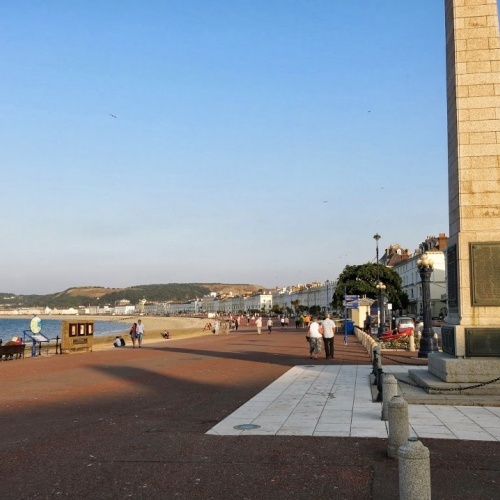 My plans are to head over to Llandudno, Wales and spend a few days there. It's got some nice hiking areas and it's also by the beach which works great for this heat wave that's been going through the country. For dinner we went back to the place where we had our first cider today since they were advertising fish n chips plus peas and a beer for 5.99 pounds. The food was pretty good and the place was crowded. I think drinking all day had got to both of us though because after the first drink we decided we were done for the night. I was doing a little research and found out that there's a bar pretty close to the hotel we're staying at that serves Samuel Smiths (one of my favorite breweries that brews their beer a few miles from here). I'm going to swing by tomorrow and have a pint or two. Eric and I started off by having breakfast at the hotel then we set off to tour the St Andrews Old Course. They have a tour each day at 11 and 2 so we rushed to get to the course in time for the 11:00 tour. 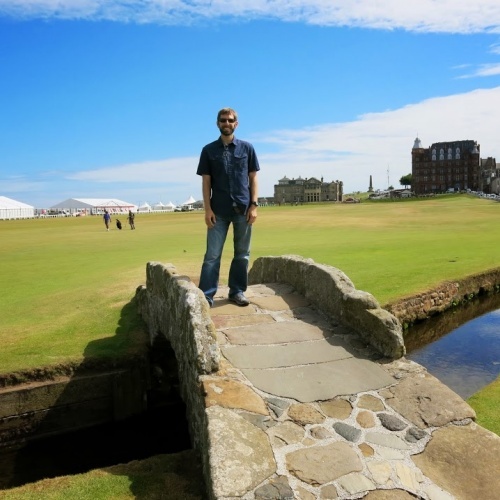 The tour lasted about an hour and walked us through a few holes and the Swilcan bridge. After the tour we had a quick bite to eat and then made our way into Edinburgh to return our car and catch a train down to York. We made our way into the city and successfully navigated to a gas station and back to the rental car center without any issues. Apparently the Edinburgh Waverley train station doesn't have any trash cans available due to bomb scares or some nonsense so we had to carry all of our trash around for the next couple of hours until we got off the train in York. The train ride was another experience all together. We waited too long to buy our tickets and ended up paying about double what we should have (quite the costly mistake). When we boarded the train, some seats were reserved and others weren't and the non-reserved seats filled up pretty quickly. We ended up standing up for about an hour and a half until the train got near Newcastle-Upon-Tyne and the train emptied out. We got into York and checked into our hotel. It was nice to have access to an air conditioned room since it was 93 degrees outside and we'd been sweating on a train for the last 2.5 hours. We relaxed for a few and then went out to find some dinner. We ended up at a place called Yo! Sushi and then went to a Tesco to buy a few beers. 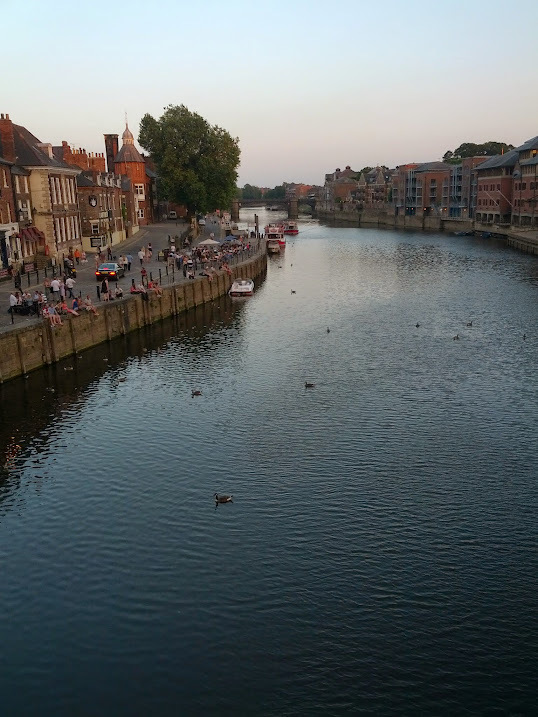 We've got a few full days here in York so we're going to walk around the city and explore tomorrow. There's quite a few old buildings and the old city wall is a giant walking trail now which will be fun to go on. I also want to head over to Tadcaster and check out the Samuel Smiths brewery and try some of the beers fresh from the source. The hotel we stayed at last night had a free breakfast in the morning so we had a nice hot breakfast and then started our drive toward the Glenfiddich Distillery. We did some research last night and found out that both the Glenfiddich and Glenlivet distilleries have free tours and both gave out free samples of whisky at the end. 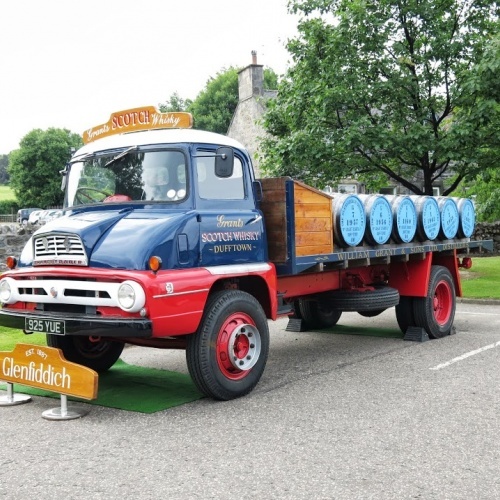 The first distillery hit was Glenfiddich. The tour lasted about an hour and took us through the entire process from boiling the malted barley all the way to casking. At the end of the tour we were given a sample of the Glenfiddich 12, 15 and 18. The Glenfiddich 18 was really good. Eric ended up getting a small bottle to drink during the rest of the trip. We had a quick lunch of muffins and apples before heading to the Glenlivet distillery. Their tour was only about 45 minutes but went through the entire process as well. At the end of this tour we were only given one sample and had to pick between the 12, 15 and 18. I chose the 18 year and thought the Glenfiddich 18 was better. The Glenlivet 15 is my scotch of choice when I'm at home though. 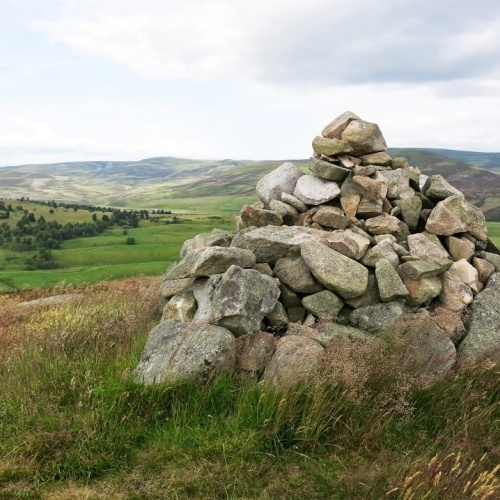 In order to get down to Dundee and our hotel for the night, we needed to drive through the Cairngorms National Park (a 1,700+ square mile park). The views along this drive were great. We were taken through some very steep mountain passes and some very narrow roads. We got to one spot and hiked up a small mountain in order to get some great 360 views of the highlands. We were originally planning on bypassing the park in order to make better time but we're glad we took the longer route! We stopped in Dundee for dinner and to stretch our legs a bit. 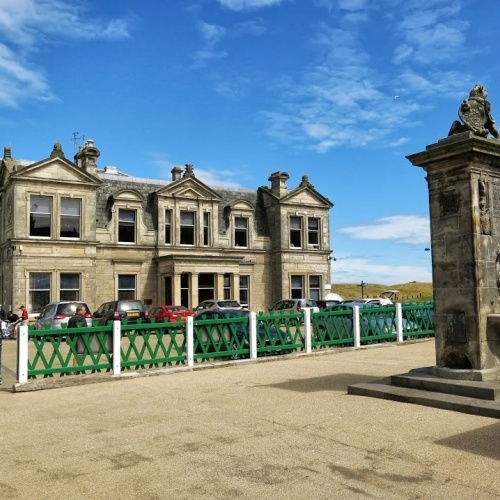 Our hotel is at the Drumoig golf course between Dundee and St. Andrews and there isn't anything around here so we also wanted to pick up a few snacks and stuff. 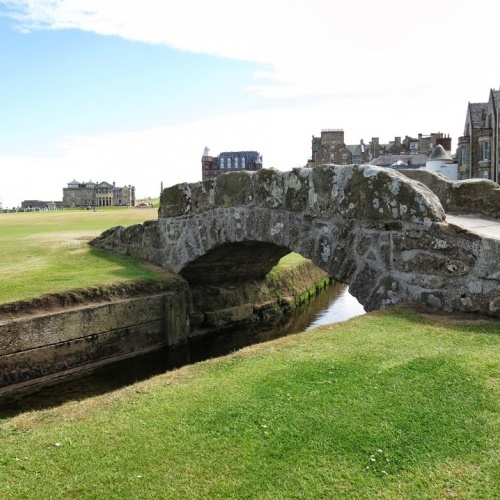 Tomorrow we're going to head down to St. Andrews to take a tour of the Old Course before returning the rental car to Edinburgh and then heading to York, England. 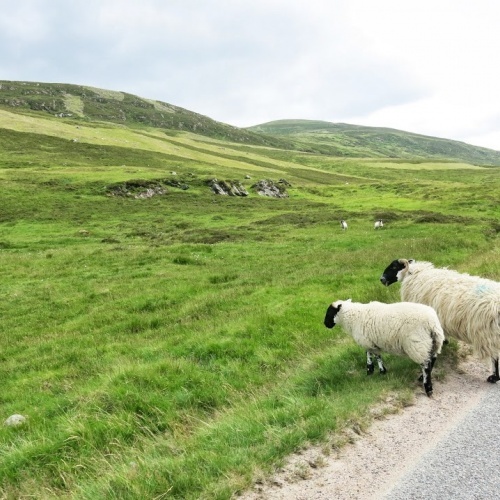 In order to tour the Highlands, Eric and I thought that renting a car for a few days would be the best way to see everything we wanted to. 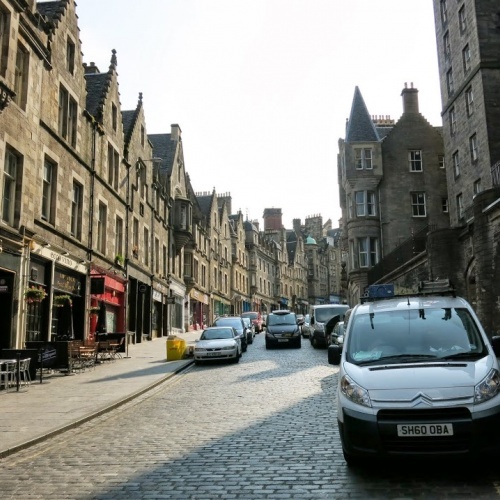 We found the Europcar rental station and picked up our car at the Edinburgh train station. It was rather exciting trying to get out of the city. After several stalls and issues getting into first gear, we made it onto the motorway and on our way into the highlands. One of Eric's coworkers has a pen pal in a town called Sterling and he gave Eric something to drop off at his pen pal's house. We made our way there and Eric dropped the gift off and then we headed north to Inverness. The scenery was great along the drive. A lot of it reminded me of the pacific northwest mixed with a little bit of Colorado. We hit a little bit of rain here and there but it ended up passing pretty quickly. 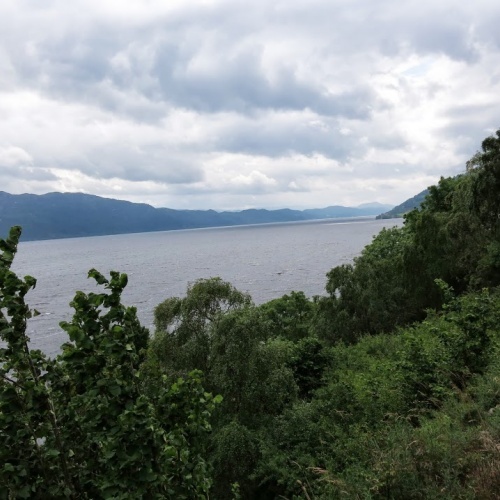 We decided to head over to Loch Ness to get some photos before heading into Inverness to walk around. The drive to some viewpoints along the Loch was nice. 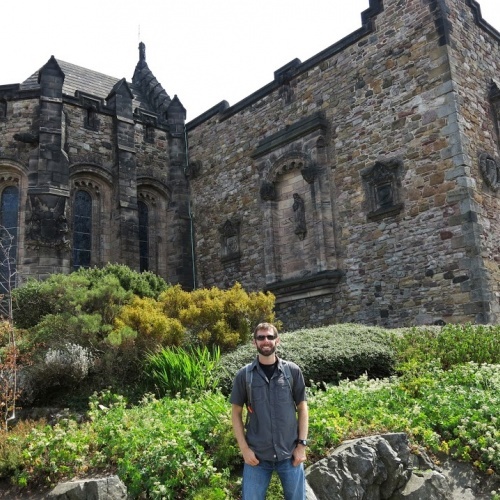 We stopped at a gift shop so Eric could pick up something for his nephew and then went to the Urquart Castle. Unfortunately they wanted 7.80 pounds to enter the castle so we took a few photos and opted not to go in. We navigated back to Inverness and found a parking garage and then walked around the town a bit. 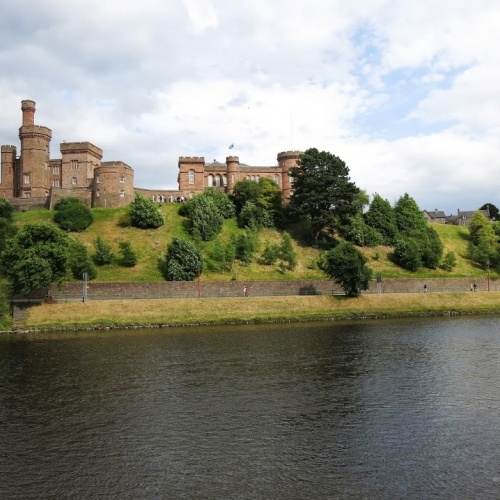 We saw the Inverness Castle and walked along the River Ness. Both of us were getting hungry so we found a sandwich shop to get some food at. 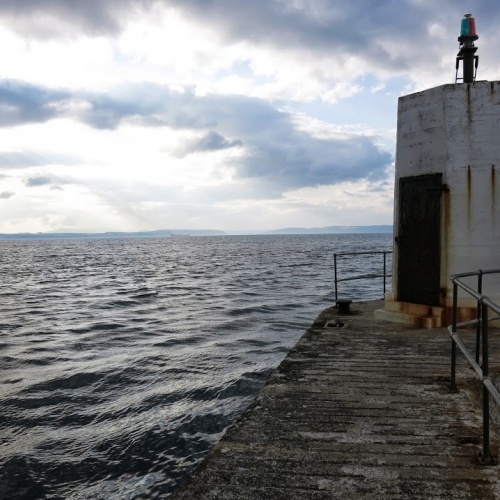 We were thinking about getting a drink in Inverness but decided to head to Nairn where we had a hotel for the night. Nairn is a tiny town on the North Sea. We got in around 4:30 and the place already seemed a little bit dead. The hotel is definitely a mom and pop run place. The rooms are laid out strangely and there's a really random mismatch of furniture. Fortunately, there are some really nice views from the window. We walked down to the harbor and took some photos. I got to put my hand in the North Sea. It wasn't quite as cold as I was expecting but there were only two kids in the water and they both had wet suits on. On the way back from the hotel we grabbed some stuff at a local grocery store and then came back to the room. 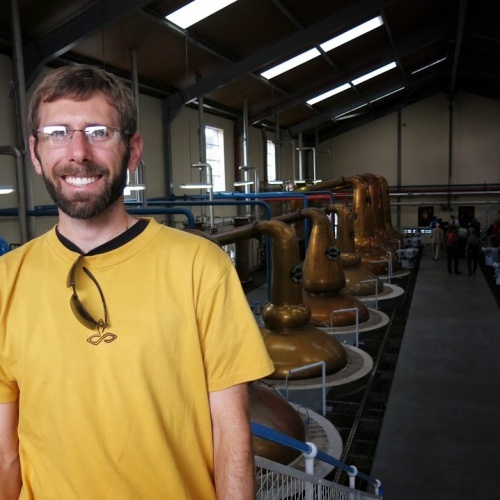 Tomorrow we're going to go on a distillery tour and then head down near Dundee Scotland for the night. 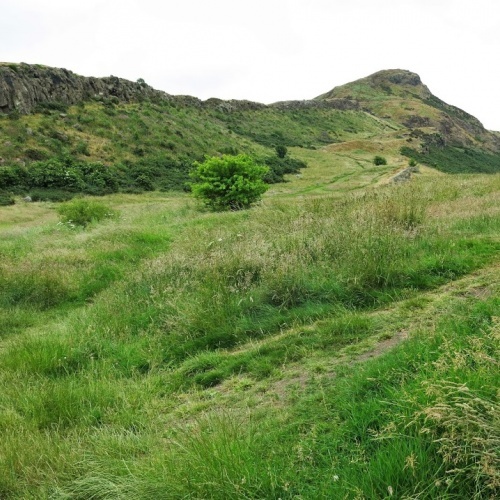 Today was the day we set out to hike up Arthur's Seat. 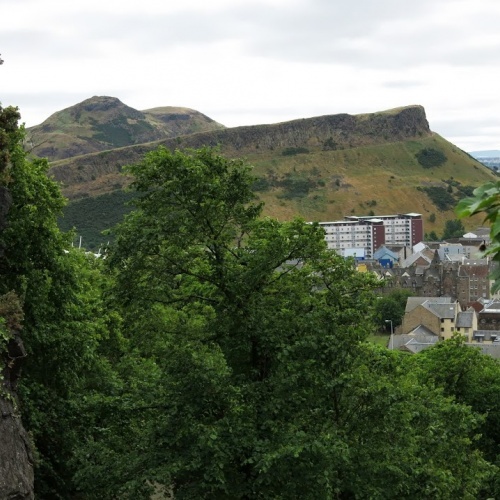 It's the remains of an old volcano on the east side of town that once climbed, gives a great 360 view of the entire town of Edinburgh and surrounding areas. Last night we planned ahead and bought some blueberry muffins to have for breakfast. After eating we started our journey to the peak. The walk to the base wasn't that bad. The route Google Maps said we could take didn't actually exist so we had to improvise a bit but we finally made it. The climb started out really easy. It was only a gradual climb and the path was paved. Soon after the path went to dirt and the real elevation started happening. After a few rest breaks we made it to the top and enjoyed the view. The wind had really picked up and it cooled down pretty good up there. We ate a snack and took some photos and enjoyed the view before heading back down. 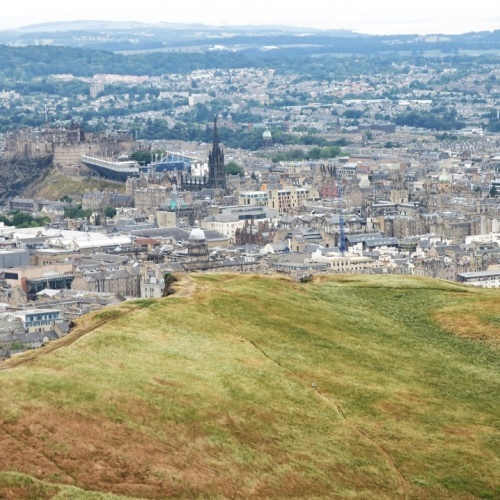 There was an area called Calton Hill that we wanted to check out so we headed there. There were a bunch of monuments and an observatory at the Calton Hill park. I wanted to climb a tower to see some good views of the city but they wanted 4 pounds to enter. 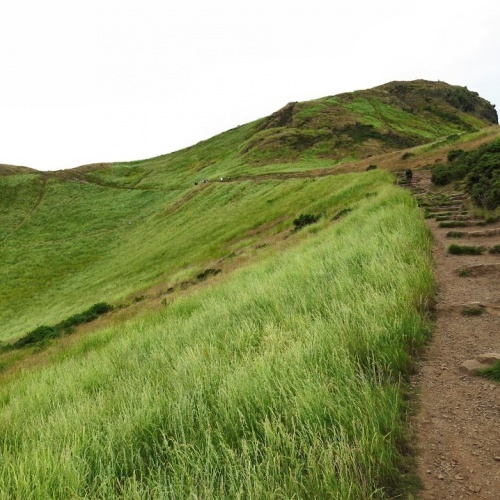 I couldn't justify it after just hiking to the top of Arthur's Seat so we carried on. We then checked out the Scott Monument (again, I wanted to climb it but wasn't about to pay 4 pounds for the pleasure). After that we were both pretty hungry so we found a pizza place and had a good pizza. Being nice and full, we decided to go find a whisky tasting and after checking out a few places we ended up at a bar called Whiski. Each of us had a flight of 4 different whisky's. My favorite from this flight was the Aberlour 10 yr. It had the right mix of peaty, smooth and creaminess. We felt pretty good after that flight so we headed to Sainsbury's (the local grocery) and picked up some more snacks and water (unfortunately you can't drink the tap water at this hotel for some reason... there's a big sign in the bathroom saying so). I also picked up a couple containers of mixed fruit and devoured those when we got back to the hotel. We're just relaxing here for a while before heading out again in a little bit for dinner. Tomorrow we head north up to Inverness and Nairn for the night. Eric and I started the day by grabbing some breakfast at a local cafe. We walked up the Royal Mile towards the castle which we planned on touring. There was supposed to be a great view of the castle from the end of the Royal Mile but they had a big stadium set up there for some kind of event. We waited in line for about 45 minutes for tickets (If you're going, buy your tickets online... it gives you FastPass access so you can skip all the lines) and then we entered the castle. As soon as we got in they were starting a tour so we jumped onboard and walked around the castle for about 30 minutes listening to the guide give us information about the various buildings on site and the history of the castle. After the tour we hunted down some water (apparently water fountains in public places in Europe don't seem to exist). We went into a cafe that had carafes full of water and glasses next to it for free drinking. I ended up pouring several into my own water bottle (and didn't feel a bit guilty after paying the 16 pound entrance fee to the castle). 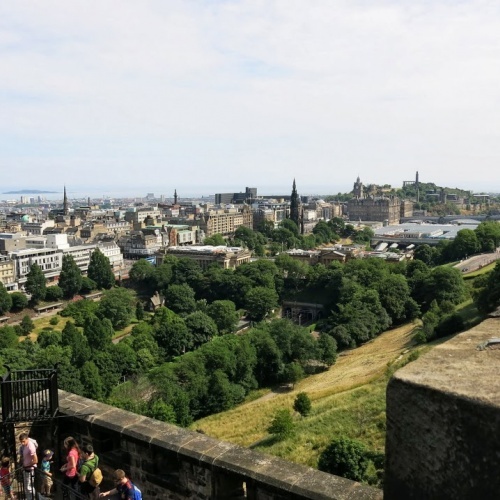 We got to see the Scottish crown jewels and the Stone of Destiny (the rock that's used in all coronations in the UK) and then toured through several of the other buildings and walked through the various museums and memorials they had on site. After the castle tour we left and walked down the Royal Mile again. We passed a few whisky shops (It's not Scotch here... it's just whisky) and decided to do some sampling. We didn't want to pay for the tour at the Whisky Experience shop so we found a restaurant that was offering some flights. For 11.95 pounds each, Eric and I each sampled 4 different whisky's. I had a Highlands flight and Eric had the Speyside flight. I really enjoyed one of mine in particular and will probably try to hunt it down and buy a bottle before I leave Scotland. We also went into several wool shops. I'm tempted to buy something woolen but I'm not sure what I want yet. I've been happy to see all of the labels say that the stuff is produced in Scotland and not imported from overseas for tourists. We stopped into a Sainsbury's to pick up some snacks and breakfast for tomorrow and now we're just relaxing in the hotel a bit before heading out for dinner and another drink or two. I've heard the name of the city pronounced many different ways, but the majority of people here seem to pronounce it "edin burrow." Today was a long day of traveling. I started in Galway, Ireland this morning and jumped on a bus to Dublin Airport at 9:45am. I got to the airport about 5 hours before my flight but wasn't able to check in until 2 hours ahead of time. I ended up spending the entire time reading another mystery novel I picked up from the hostel. I finally got checked into the flight and headed toward the gate area. When it finally came time to board I saw that I was going to be on a really small prop plane. The flight was fine but it was definitely one of the noisiest commercial flights I've been on. Everything inside the aircraft was shaking around. When I landed I had a couple hours before Eric showed up so I just hung out at the Edinburgh airport. Eric's flight got in a little earlier than expected so we jumped on the bus to the city center and checked into our hotel (the Royal British). Both of us were pretty hungry so we set out to find some food. It was pretty late already and most of the restaurants had closed down for the night. We ended up finding a place that had a pretty wide variety of food and I got a calzone (I had been craving italian for the last few nights). By now it was after 11 and pretty much all the pubs had their last call so we just came back to the hotel. 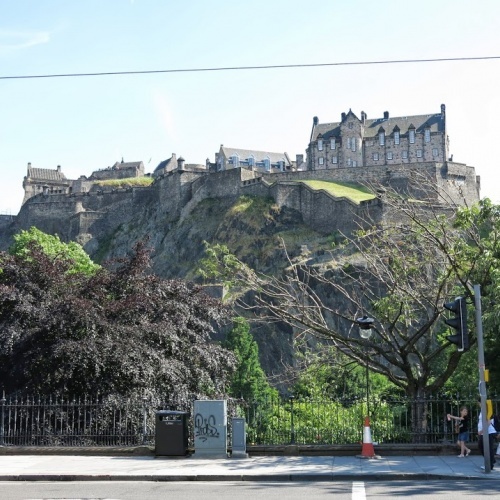 Tomorrow we're going to check out the Edinburgh castle and walk the Royal Mile. There will be some amazing photos tomorrow so stay tuned! All the countries I visited on this trip (in yellow). Traveling is something I've loved doing for as long as I can remember. I've been lucky enough to travel out of the US a few times but never longer than 2 weeks at a time. I decided that I should go see the world and experience all it has to offer. I booked a one-way ticket to Dublin, Ireland to depart on June 26, 2013. After I get to Europe I'll let serendipity take hold and see where I end up. No schedules and no itinerary… just go with the flow. That's as close to a plan as I'm making. My name's Brandon O'Brien and I'm a travelholic. Before this journey I've been to 11 countries and put over 17,500 miles on various motorcycle trips through the USA and Canada. I'm a self-employed web developer so I'm fortunate enough to be able to work anywhere there's an internet connection. That's what truly made this experience possible.